A real surprise, this one, which literally only displaced my original choice for the fifth spot, Monument Valley, in the last few hours, having been a post-Christmas purchase in light of its presence on a couple of other lists. Even now that puzzle games are my iPhone distractions of choice, most of what I play is a variation on a classic theme – falling blocks, matching blocks, unscrambling letters, or picross. I’m not sold on the format for most long-form experiences but find it undeniably the platform of choice for time-wasting puzzlers. It’s usually to blame when my homeward commute has to be passed without podcasts after I’ve blown through the battery. 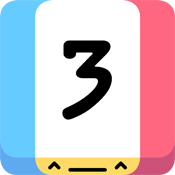 Threes is the closest thing in the puzzle realm to being completely new that I’ve touched upon in a while. It’s a bit of a maths game, a bit of a sliding tile puzzle. I know being difficult to explain succinctly isn’t often an indication that a £2 puzzle game is a winning formula, but trust me here. Watch the demo animation on the official site and it should become clear. Games are finished quickly, making it a great time-waster, and the advanced strategies are there for those with a sufficient head for numbers. My high score is 3,078 at the time of writing, with a mere 750,000 required to get you into the top ten and a credulity-stretching 1.8 million sitting on top. Not bad for a game that starts off tasking you with calculating 1+2. 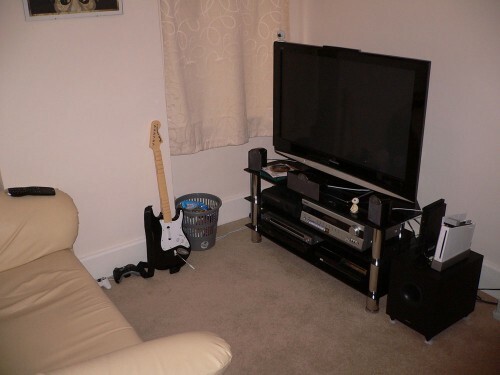 When I moved house back in March, the opportunity came up to forgo one large bedroom in exchange for two smaller ones, and given that most gamers would love a dedicated room for their televisual pursuits, I went for it. I didn’t actually own any furniture of my own, though, least of all storage for my large collection of games and DVDs, so there was some necessary investment there. First order of business was a TV stand, and I went for this glass model from Levv. I actually paid a little less than what it’s going for now – just under £60, if I remember correctly – but it’s still excellent value and is a nice stand. Just don’t expect any help when it comes to assembly, because the instructions aren’t great. 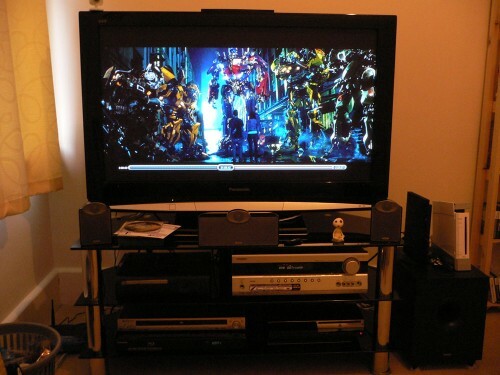 I’ve recently added a dedicated Blu-ray player, a Samsung BD-P3600, to the mix, mainly to reduce wear on the PS3’s drive but also to give me access to region B stuff in these times when it’s suddenly more expensive to import films for my US PS3. It’s also faster and quieter than a PS3 and shares many of its media features, which is nice. I took the opportunity to jettison my faithful old Logitech sound system for an Onkyo TX-SR507, which has four HDMIs and handles all the new HD audio formats, and a set of Tannoy SFX 5.1 speakers. I’d been wanting to upgrade that for a while now and this seemed like a good time. With the Blu-ray player I was fast running out of HDMI inputs on the TV anyway, so it saves me finding a bigger HDMI switch as well. I’m seated on a two-seater cream leather sofa, which I paid a whole £20 for from a friend. Certainly not the most comfortable I’ve ever sat on, but more than workable and fits nicely into the room. And just to tie it all together I’ve got a framed BioShock lithograph on the wall.